We get gigs like a fete or country show when we are the only kite display team there. It’s always good to have a few static kites and a bit of colour in the sky when we are not actually demonstrating but by the time we have got our tent up, banners raised, a quick check of the wind in the arena followed by assembling whichever kites we think will fly best (plus contingencies) there is not a lot of time left to spend on erecting and staking out single line kites. What we need are kites that are quick to put together and will stay, reliably, in the air possibly holding a bit of laundry aloft. We already have a superb Morgan Delta in team colours as mentioned in a previous article (see the video on the Close Encounters Kite Display Team web-site) and recently we added a couple of off the shelf deltas – the HQ Delta Graphic Rainbow. We were not that sure how much lift these kites would give nor how stable they would be. We looked at stability first and ordered up some matching 10 meter tails – there’s a loop on the bottom to accommodate! Putting these kites together is best done flat on the ground with the nose pointing in to the wind (it possibly says that in the instructions). Take note of how they are folded so that you can put them away the same and that way they don’t take up a lot of room. Every rod seems to have a major role in holding the rest of the kite together if one comes undone the whole thing collapses! You need to get the leading edges together and slid right down to the bottom before the cross spreader goes in or you will find yourself starting over. Having done it a couple of times I can get this kite from the bag to airborne very quickly. The Delta Graphic Rainbow comes supplied with 200ft of 150lb breaking strain line (it looks thinner) and goes quietly away in as low as 4mph. You will get a bit of flapping and rustling in bigger winds and I am not sure how much faith I’d have over 18mph but the makers claim 5 to 20mph. For a kite this big – it’s 3meters wide by 1½ meters tall – I didn’t think that it generated a lot of pull so I was very surprised when it didn’t even blink when we attached one of our large inflatable dogs to the line – most impressive – the wind was running between 6mph and 12mph. I didn’t get any useable video of it lifting anything – email me if you want to see the rubbish bit I did get. 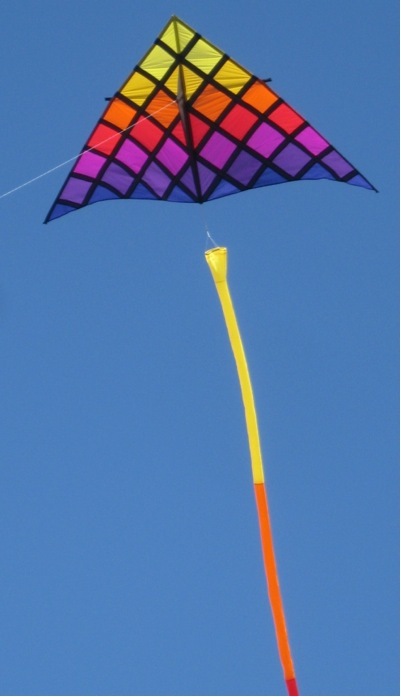 The kite has a nylon sail and is framed in 8mm fire glass – not bad value in my book for around fifty quid! This entry was posted in KL Archive, Single Line and tagged Delta, HQ Kites, Rainbow. Pothecary’s Corner: How we started – Part three.